Volkswagens Golf Plus – a high-roof version of Europes top-seller – is one of 15 new vehicles available with optional adaptive front lighting from German supplier Hella (the others include the BMW 5 series, Opel Astra and Land Rovers Range Rover Sport). 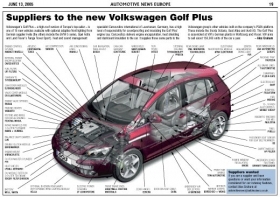 Heat and sound management specialist Carcoustics International of Leverkusen, Germany, has a high level of responsibility for soundproofing and insulating the Golf Plus engine bay. Carcoustics delivers engine encapsulation, heat shielding and dashboard insulation to the car. It supplies those same parts to the Volkswagen groups other vehicles built on the companys PQ35 platform. These include the Skoda Octavia, Seat Altea and Audi A3. The Golf Plus is assembled at VWs German plants in Wolfsburg and Mosel. VW aims to sell about 150,000 units of the car a year.